Many US taxpayers have a difficult time understanding what marginal tax brackets are and the differences between credits and deductions. I will illustrate these three concepts for a hypothetical single taxpayer, Alex. Alex’s gross income is $225,000, all from his job, shown in solid red. Deductions reduce your amount of taxable income. Alex has deductions that can be found in lines 23 to 35 of his 1040 in the amount of $15,000 (patterned red). 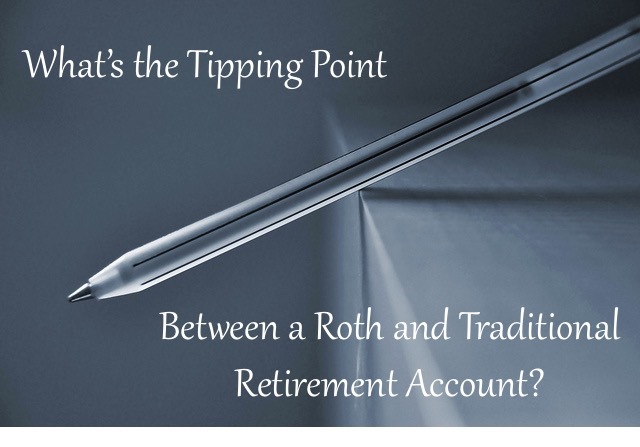 Examples of this kind of deduction include tuition and qualified fees, heath savings account contributions, IRA contributions, and moving expenses. 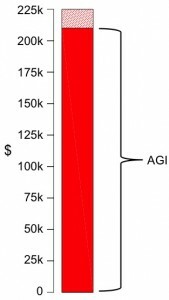 Therefore Alex’s taxable income is reduced to $210,000 (solid red). This is Alex’s adjusted gross income (AGI). Alex’s taxable income is further reduced by his exemption and itemized deductions, which are $10,000, found in lines 40 and 42 on his 1040. Alex’s total taxable income (line 43 on his 1040) of $200,000 falls across the 10%, 15%, 25%, 28%, and 33% tax brackets. That means that a portion of Alex’s income will be taxed at each of these rates. The lower and upper bounds of each tax bracket and the corresponding tax rate is in the table below. You can see that both the income ranges for each tax bracket and the tax rates increase as the amount of income increases. Here are the tax brackets applied to Alex’s income. Alex will owe an amount of tax from each of these brackets. Here we have pulled out the amount of tax he owes from each bracket and lined them up next to his income. Remember, he does not owe any tax from the piece of his gross income that he was able to deduct. You can see that Alex owes more tax from the higher brackets both because they cover larger amounts of income and because the tax rate is higher. This is Alex’s tax owed from line 44 on his 1040, $50,528. He would find this amount by looking it up in the IRS tax tables, but the tables are based on the calculation explained above. The mistake that most people make is thinking that their entire taxable income is taxed at their top marginal rate, but you can see that portions of their income are taxed at every rate below their top rate according to the brackets. Credits directly reduce the amount of tax you owe. Alex has $10,000 in credits from lines 47 to 53 from his 1040 (patterned green). These credits are directly applied to his tax owed, which goes from $50,528 to $40,528 (solid green). You can see that the value of a deduction depends on which tax bracket your income tops out in, whereas a credit is always valued the same amount. In Alex’s case, his deductions and exemptions of $25,000 reduced his tax owed by 33% of $25,000 (aka $8,250). His credit of $10,000, on the other hand, reduces his tax owed by $10,000. If your income tops out in a lower tax bracket, deductions will be “worth” even less in terms of reducing the tax you owe. Our hypothetical taxpayer Alex owes $40,528 in federal income tax on his income of $225,000, which means he pays a total federal income tax rate of 18%. Disclaimer: Since this is a hypothetical example conjured to illustrate the concepts of marginal tax brackets, deductions, and credits, it is likely that some of the numbers are unrealistic or there may be nuances of the tax code that I have ignored (e.g. the AMT, capital gains income). Since this isn’t tax advice, only an illustration of the stated concepts, I hope you don’t mind! Is there anything you struggle with regarding the basic math in the tax code? 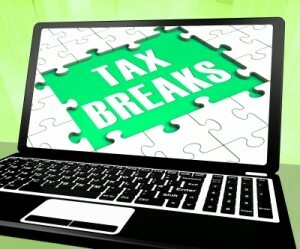 What is your top tax bracket and what kinds of credits and deductions are you taking this year? Do visualizations help you understand these confusing concepts? 29 Responses to "Marginal Tax Brackets, Deductions, and Credits Explained Graphically"
I tend to add FICA taxes in with income taxes when I’m calculating the total amount I pay every year and what my overall tax rate. 6.8% is a lot to ignore/forget about. I added the word “income” above to clarify! You are right that we pay lots more in taxes than just federal income tax, but I think it’s the most confusing to people. Emily, this is the greatest graphical explanation of the tax code I’ve ever seen. I can’t tell you how many times I’ve had to explain this concept to older and smarter individuals who complain that they are taxed at an overall rate of 25%. Most of the time they still don’t believe me after I draw out the math. It’s amazing to me how people can get away with knowing so little about the basics of the tax code – and it’s not just the IRS tax tables that do it (although it starts there), it’s the use of tax software and tax professionals. It’s so easy to calculate your overall rate, too – just two numbers! It’s apparent that a lot of people don’t understand the concept of marginal rates because I still hear people claim they wouldn’t want to make more money for fear they would be in a higher tax bracket and actually end up with less money after taxes. That’s just not how the tax code works. I even heard my 12th grade government teacher make that mistake, and I wouldn’t have expected that from someone teaching that subject! My parents were/are also convinced of this. I recently sat them down and showed them, but they still don’t entirely believe me. They prefer to believe in a universe where the tax code incentivizes people to stop working, for fear of being bumped up a tax bracket. William @ Bite the Bullet recently posted..Will The Stock Market Crash Now? Haha, I like Doug’s attitude! Retire By 40 recently posted..Can You Retire Comfortably On $31,722 per year? Yes, the source of the income certainly matters for the rate – and also the applied deductions and credits and so forth. I’m sure we all want to pay the lowest possible rate on the highest possible amount of income. It’s a good way of thinking in terms of earning more income, not so much for generating it through investments. Well, we are in the 15% bracket. I’ve always felt that the W-4 instructions don’t do an adequate job of explaining how to properly withhold for dual incomes, which is why we owed last year and, even with 0 exemptions, my employer still under-withheld in 2012. It’s been a few weeks since I filed, but I believe we just barely qualified for the saver’s credit (I hate how fast that falls off). Also got the student loan interest deduction. We are in the 15% bracket, too. In previous years our withholdings were just about right but I’m not sure about this year yet (more to come on why we haven’t done our taxes…). I always shake my fist at the saver’s credit since the only reason we don’t qualify is that we are students, and obviously not the type of students they want to disqualify! This is the BEST explanation I have seen of this concept. I’m going anon so I can point my students to this page in the future. (Yes, there are graduate students who don’t understand marginal tax rates.) LOVE the color coded charts. Thanks for the compliment and the promotion! I hope your students stick around to participate in the community here. Great explanation with the color coded graphs. I certainly don’t understand my taxes as well as I should. When my business is not in the picture, I might take a stab at doing them myself. I’m not sure with the rental stuff. I don’t want to miss a deduction or not list something correctly. It all goes back to my strange fear of the IRS. I’m not sure where it came from. Maybe my parents were audited when I was a baby or something! I think pop culture teaches us to fear and be intimidated by the IRS – or maybe it’s the tax-preparation industry so they get our business! I definitely understand getting an accountant to do your taxes if you run your own business – or even are a landlord – but do you pore over his work until you understand it? Our taxes are very simple right now so I can’t really talk, but I like to do our return by hand and then check it with tax software to make sure we didn’t miss anything. I forgot about the Making Work Pay credit the year it was issued so the software caught that – good thing! Excellent representation, loved the idea! SB @ One Cent at a Time recently posted..What to do With your Annuity Investment in Retirement Plan? Thank you! I’ve been learning how to use AutoCAD recently for my work so I decided to play with it a bit more in my personal time!